Let's continue our journey through the Underdark with the second part of the Legend of Drizzt series, Exile. This is the book that inspired Chris Perkins while he was writing Out of the Abyss, this season's large DnD campaign. In the foreword, he writes that the book reminds him of Alice in Wonderland. I, too, thought of Alice's adventures while reading Exile, but the read hardly inspired me. Frankly, I found this book quite dull. 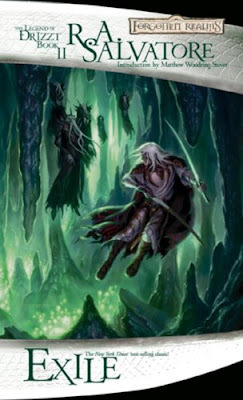 My main problem with the story is that Drizzt wanders around the Underdark and things just happen to him. He's hunted by the drow (and a zombie version of his father) and while that may be incentive enough for anyone to move on, it just doesn't make for an interesting novel story. Salvatore throws in lots of encounters, and like Alice in Wonderland, each encounter seems to exist in a vacuum. Drizzt meets a couple of wacky friends along the way, atones for old sins in the svirfneblin capital and saves a hook horror with multiple personalities from itself. Unfortunately, the cool Illithids on the cover doesn't get much stage time. And when they finally do show up, Salvatore misses out on several mindreading opportunities. They could easily provide the quirky “is this real”-kind of story that defines Alice's meeting with the Caterpillar or Cheshire Cat, but that never happens. I would really like to add that feeling to my own Underdark campaign one day. Exile is a story of breaking up and dealing with your past while staying true to yourself. I found the best part of the book to be the prologue, where Drizzt almost succumbs to a darker version of himself. It's all downhill from there, though, and it all culminates in an extremely awkward Star Wars-esque battle, complete with a cringe-worthy “I am your mother”-line. 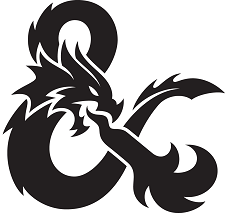 The drow back in Menzoberranzan are far more interesting this time around, and we also get meet Jarlaxle and his band of mercenaries for the first time. Ultimately, I do not recommend this book. It suffers from the “second part of the trilogy”-syndrome. Read it only as a bridge to the third part, Sojourn, and read it fast if you do.